Since 2008, the Grand Annex has been the host to performing music groups from every genre from Jazz to traditional Irish music. On Sunday, June 9th, the Zhena Folk Chorus will be on stage at the Grand Annex. 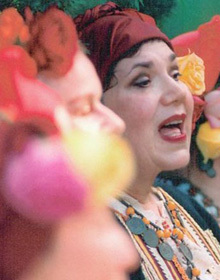 Dressed in colorful authentic costumes, the Zhena Folk Chorus is a group of eight women who sing traditional songs from Bosnia, Bulgaria, Croatia, Georgia, Hungary, Macedonia, Romania, Russia, Turkey and Ukraine. These women give life to the songs that have been sung through Eastern Europe for decades. Spectators explore the intricate rhythms, enchanting harmonies and primal themes of this joyous music. For over twenty years, the Zhena Folk Chorus has drawn audiences from all over Los Angeles. Zhena has performed at numerous festivals, ethnic and international events, conferences, museums, cultural centers, colleges, schools, and churches. An audience member commented ,"you do not need to understand the lyrics to feel this music in your heart." The Zhena Folk Chorus will be preforming at the Grand Annex on Sunday, June 9th at 3pm. Visit the Grand Annex website for more information.